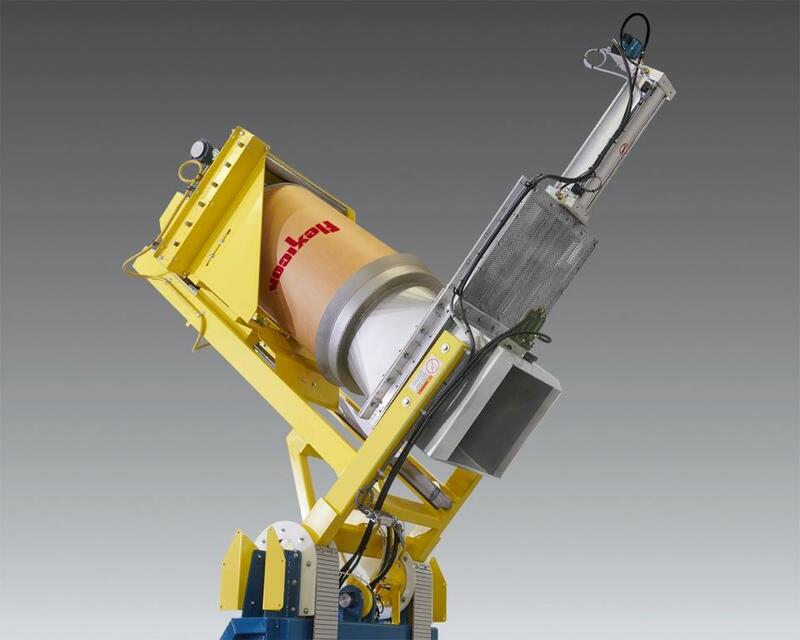 Flexicon Europe, Whitstable, UK, has introduced a TIP-TITE drum tipper designed for use with poorly flowing or agglomerated materials, allowing rapid, dustfree transfer of bulk solids, whether free flowing or otherwise. Similar in performance to open chute tippers but with total dust containment, the outlet on the downstream end of the tipper is nearly equal in area to that of the drum opening, allowing agglomerated materials and large chunks to be discharged with minimal risk of material bridging. Drums from 114 to 208 litres are positioned on the tipper platform, which is raised by a hydraulic cylinder, seating the rim against the circular end of the discharge transition. A second hydraulic cylinder tips the platform-hood assembly and drum, stopping at dump angles of 45, 60 or 90 degrees with a motion-dampening feature. At full rotation, the transition outlet mates with the gasketed square inlet on the lid of a hopper or downstream process equipment, allowing a pneumatically actuated slide gate valve to be opened and closed for total or partial discharge with no dusting.